feel like this search has been endless and lasted ages, maybe even centuries. that my prized tights collection is quite happy to have a new family member. PPS- I am updating my links. If you would like to be added please let me know! I'm jealous you can wear tights right now! If I wore it, I'd melt in this 103 degree weather! they are adorable! lovely tights, looks like you have a nice collection there. a girl can never have too many! Nice tights! You look really pretty. Btw want to exchange links? I love your blog. all in this blog is so good! will it be too lame if i buy them being that a few bloggers did ? oh well. they look great on you ! omg i love those , they look awesome on you!! that blazer , i want it. i recently bought some tights with little hearts too. I will post that soon!!! I just love your blog. You have amazing style, I'm always excited to see what you wear next! Very inspiring! i want to be linkeed! i cut my hair short :( and i miss long hair now. im diying one right now! I believe this is the perfect early fall outfit! I've been looking for tights like those. I have just added your blog to my blogroll! You are so stylish! these dotted tights make the whole outfits looking very chic! love your new tights! can´t find any good polka dotted tights in here at all! you look adorable.the tights are amazing. I would love to be added to your links. Gorgeous, darling! Love the tights and blazer! GREAT look, i love the jacket, and the tights. great blog, i am now "following"
Your blazer is wicked! Looks like such a pretty colour! Oh and i would love to be added to you links, I'l put yours up on my blog today! good job on tracking down the perfect pair! I love your whole outfit! Your blazer looks so comfy! Love the tights. I love your outfit ;) nice nice. I have seriously been looking for tights like that too. Nordstroms? Damn, I'm in London. They look so much like the tights in all the Balenciaga shows and editorials. and I would like to be added! awww thanks. cool tights ^^ love the outfit. Love this outfit, especially those tights! I'm jealous, were just getting into spring/summer here and its almost too hot to wear tights already! I love this outfit, especially the jacket! And those dotted tights are so cute! Yes, I'm really excited :D Thank you! I love this look and those tights are simply to die for. Nordstrom? I absolutely must see if I can find them! hi! i have discover your blog and i like it very much!! i add you to my list of blogs! Great tights.. love em with the blazer! I love the tights- I've also been searching for the perfect polka-dot tights (and the perfect heart tights, and floral tights... :D). I'd love to be added to your links- it's www.silk-style.blogspot.com! Thanks! i love the tights!!!! those are the ones the stylish wanderer has right? well i love the way you styled them. and i love the boots. and the blazer. I've been looking for tights like that in NZ for ages too! But still haven't found them. Since YSL's death, they've been all over the runway. O my, your outfit is perfection. Love the blazer, the boots, and of course, the TIGHTS. Omg!!! I really really want your tights, why can't I find them here? 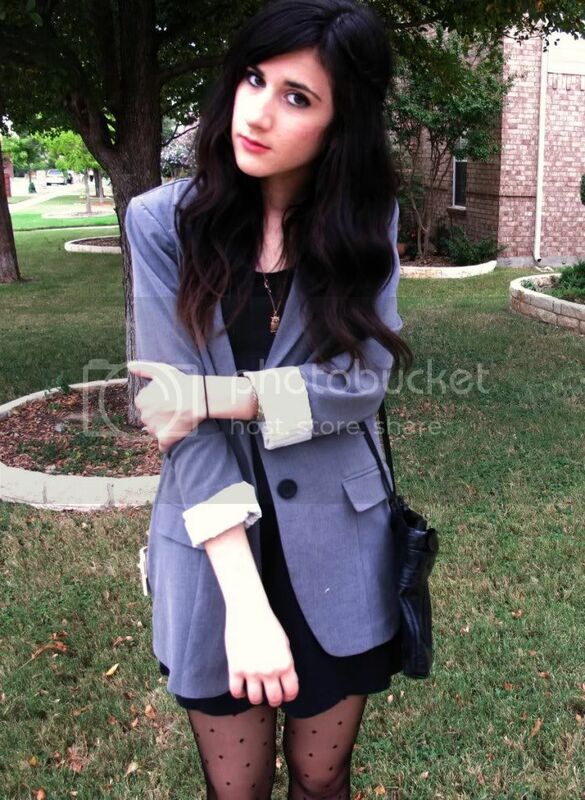 I love the pictures, your blazer is gorgeous. 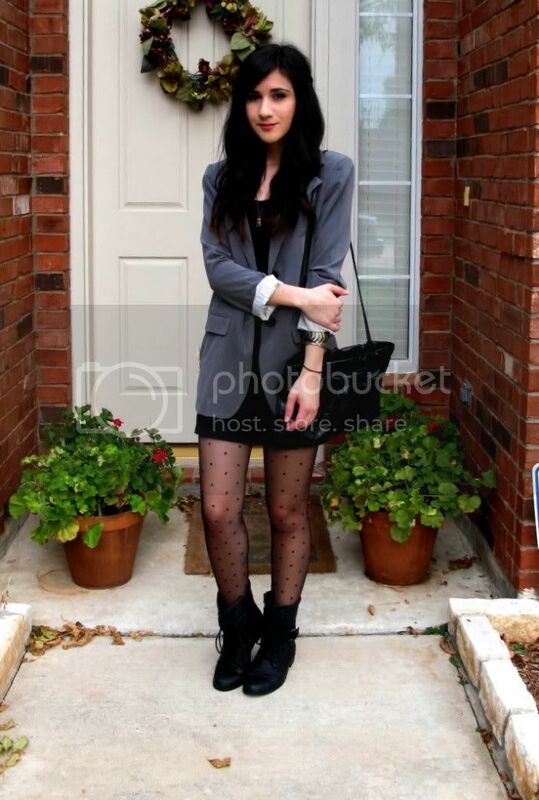 I saw another blogger who recently acquired a pair of polka dotted tights... Anyways, cute outfit! What a perfect outfit. You have incredible style. Dotted tights, I remember craving them a while back and not managing to get my hands on a pair...may have to resume my search before summer kicks in. Cute tights! Now I feel like I need to expand my collection. I love those tights and that jacket. So classy! Oh, I have a serious crush on them too! Oh, yes, I would like to be added! I already added you one week ago!! Your ourfit here is just perfect! I love the dotty tights! So lovely! I love those tights! *^_^* And I would love to be added to you links! You look great!!!! Love the tights, but right now it's something we can't wear here for now, to much heat. you look great, love the tights =) ive been hunting for some funner pairs too. and i would love to be linked! love the tights!cant wait to wear mine too! Cute tights! I love your style! i love these photos your stunning bonnie!!!!! you sooo copy the stylish wanderer..